It looks great and reflects YoWindow Inspector almost identically. It is easy to read. It opens fast and reliable. Pay attention that we are trying a new way to display feels-like temperature. 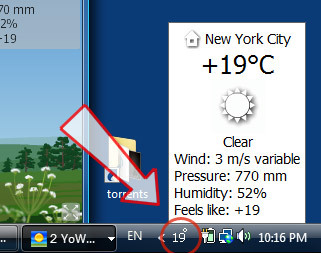 In the popup feels-like temperature displayed to the left of the main temperature. This way Inspector looks more compact and the temperatures are easy to read. Also I want to express a gratitude to our forum team. I am impressed by the number of flaws you have found in the beta builds of this feature. I think the quality of this release is perfect. with B491 now OK himself is completely! be in Window7, I eat in Windows XP. Cumplimentos for the spilled sweat. This is REALLY becoming more and more of an enjoyable program every day. You'll have to try it yourself and see! Please forgive my ignorance Because I am new to Yo Window but Who or what is Millie? And something to make you all smile, My kids think Yo Window is magic. My 6 yr old says the house lights turn on and off when ours do! You know from my previous emails and posts that I'm holding out for more details in the weather (lightning, severe weather, etc) and the weather warnings too! In the meantime, this makes it WELL worthwhile to hang around and see what comes next. Once again thanks for a great surprise. Love what you did to Millie. One of the upgrades on this version that were mentioned was "More fire." I'm guessing that has something to do with the balloons?